Every Monday Cathy from Rambling In The Garden invites us to share a vase assembled from materials collected in our gardens. 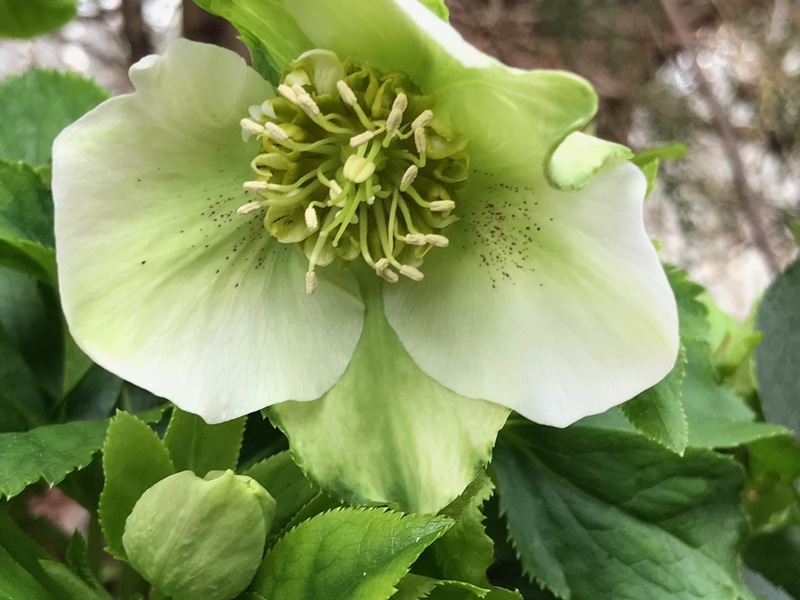 Last week I included a creamy double-form hybrid hellebore that was just beginning to bloom. I revisited the no-name plant this week and found some fuller flowers. Without even planning an arrangement I photographed them in front of a large ceramic vase for today’s Monday offering. 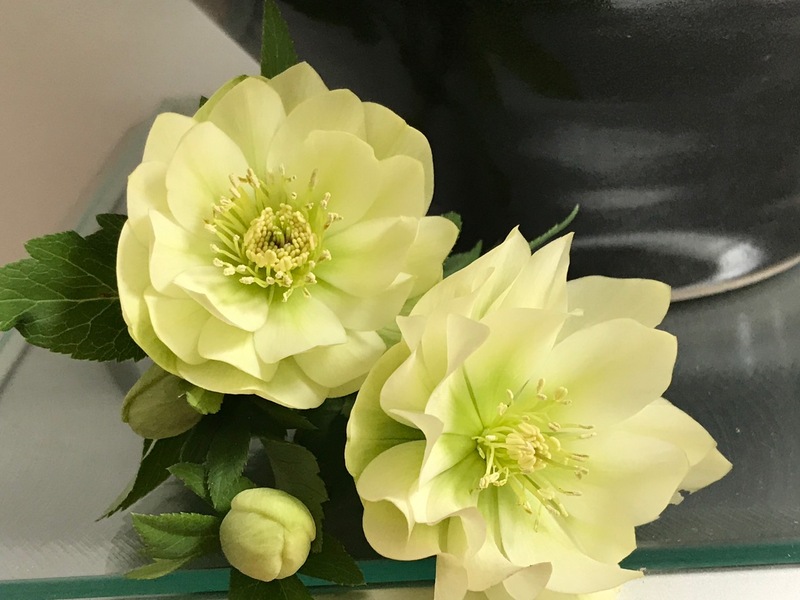 Although eventually I did float the blossoms in a small glass bowl and take pictures, these images better capture the green highlights against the ivory petals with their dancing, ruffled edges. 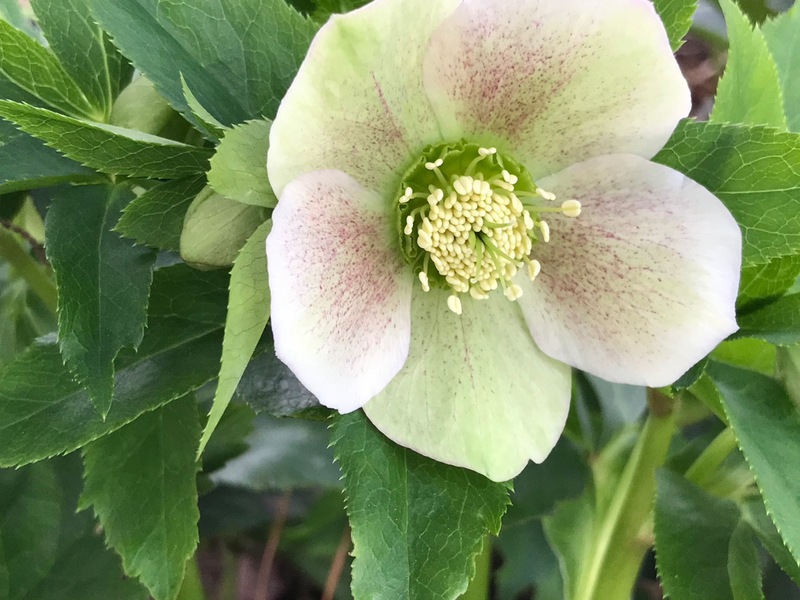 Helleborus x hybridus (Lenten rose). From PKF. Last week the weather was sunny magnificence, with one day reaching 78 degrees Fahrenheit. Here are a few more blooms from the garden. Daphne sat upon gentle breezes, making each pass by the font door a fragrant delight. 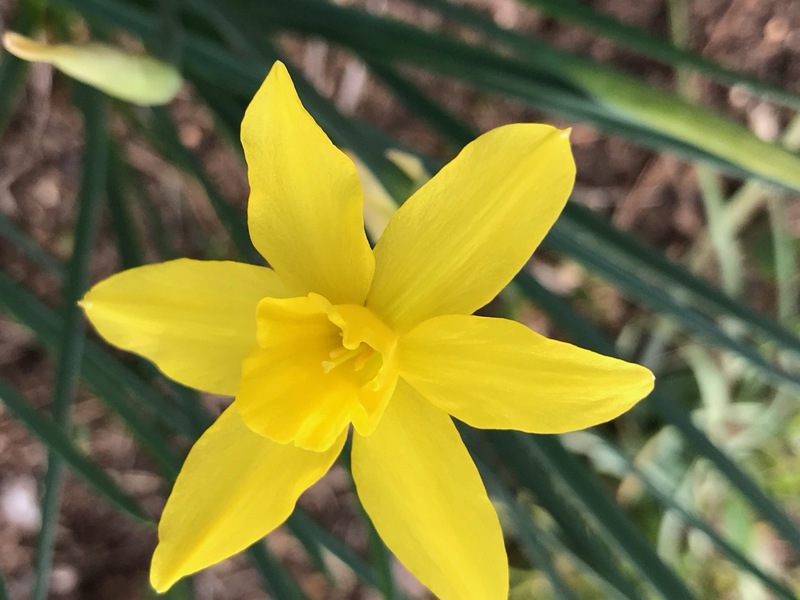 Daffodils could wait no longer to begin spreading cheer. Thanks to Cathy at Rambling In The Garden for hosting and giving us an opportunity to share flower designs across the world. Visit her to discover what she and others found to place In A Vase On Monday. 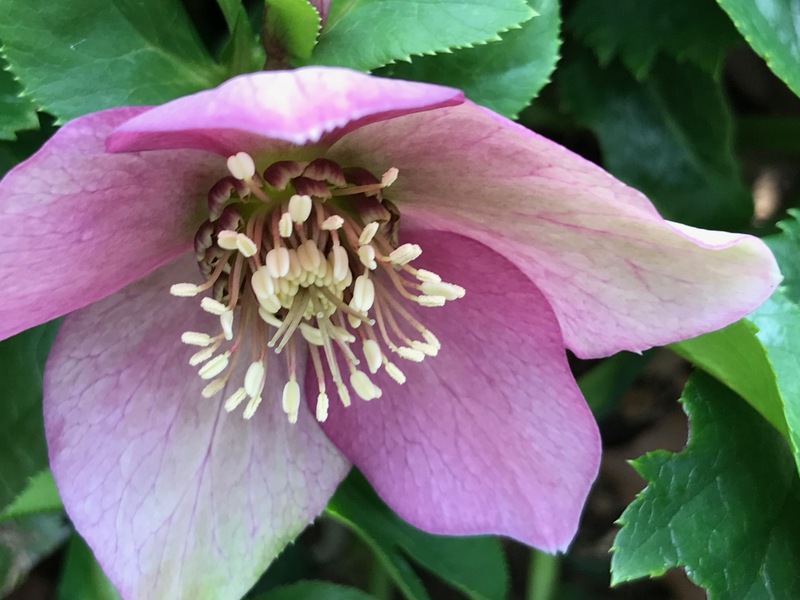 This entry was posted in garden and tagged 2019vase, daffodil, Daphne odora (Winter daphne), flower design, garden photography, Helleborus x hybridus (Lenten rose), in a vase on monday on February 11, 2019 by pbmgarden. Hellebores are so beautiful! All the ones you show us are so different from each other yet a flower that produces blooms in winter is special in itself. I like that you showed them almost ‘un-arranged’. They needed nothing to be perfect. I’m enjoying and appreciating hellebores more and more each year. The ones in my vase last week lasted very well. That’s good; I’m always reading that they don’t last in a vase. 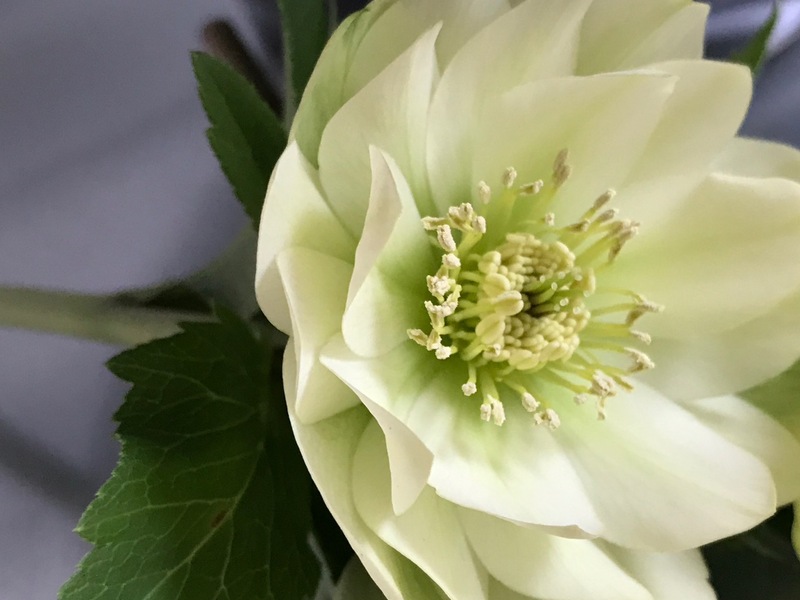 The double cream blooms on your hellebore are magnificent. Thanks Noelle. This is the first year this hellebore has bloomed so well. Well, now, aren’t you spreading joy this Monday morning with these gorgeous blooms. Thank you! Hi Judy, glad to share these precious blooms with you today. Beautiful photos. Early bloomers are so special. Thanks. It’s that time of year when every bit of color is a marvel. 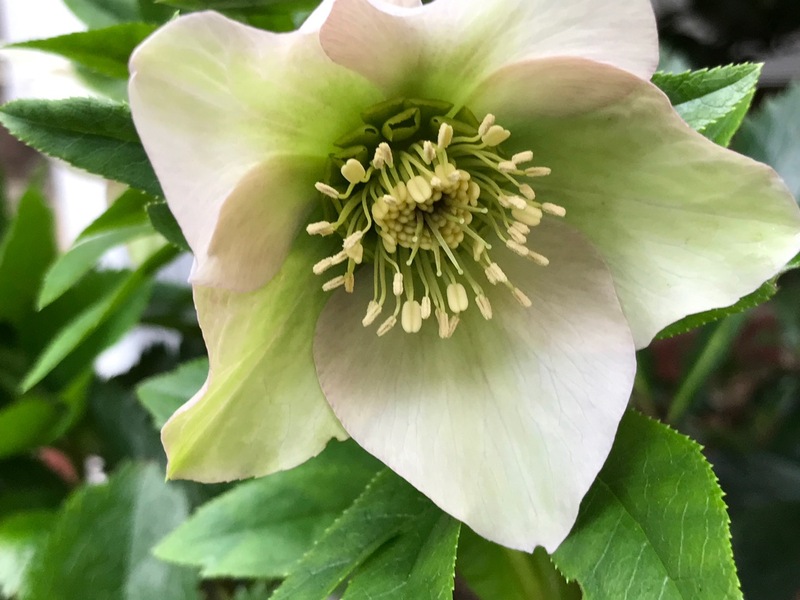 That really is an adorable hellebore, and so different from the white ones, as this is a distinct cream – I am certainly getting the urge to add to my hellebores at the moment!! Good to seeother blooms in your garden too, Susie, so thanks for sharing those with us too. Thanks Cathy. Planned to post separately about the other blooms but this was my first opportunity. I’d like to add other distinctive colors of hellebores. Hellebores are always hard to capture in a vase so floating sounds like a perfect solution. I’ve heard they last longer that way, but it’s also easier to see their faces when they’re floating. Beautiful and cheerful blooms. Everything here is lying flat on the ground because of record cold temperatures but we can’t see they anymore as they’re covered with a foot and a half of snow. Your pretty flowers give me hope that this will melt soon. Peter, so sorry you’re having to deal with this unusual winter snow. Keep safe! 78 degrees! We seem to be stuck in the 50s here, which is quite a switch. Your hellebore is scrumptious. It’s lovely to see your garden waking up. Well, we’re having a 44 degree day today Kris, but last week was great. Unfortunately I didn’t get any work done in the garden, despite the perfect opportunity. I think spring will arrive quickly so it would be wise to get on it. I love hellebores and it is wonderful how each one us different. I remember years ago not really liking hellebores. What was I thinking? Pretty pictures, you must be enjoying the Daphne! Thanks. 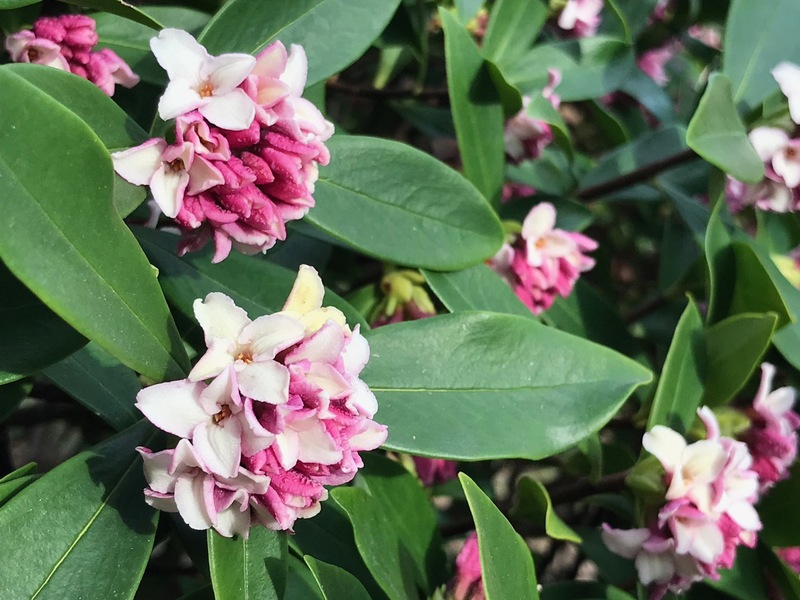 Yes, the daphne is having a banner year. 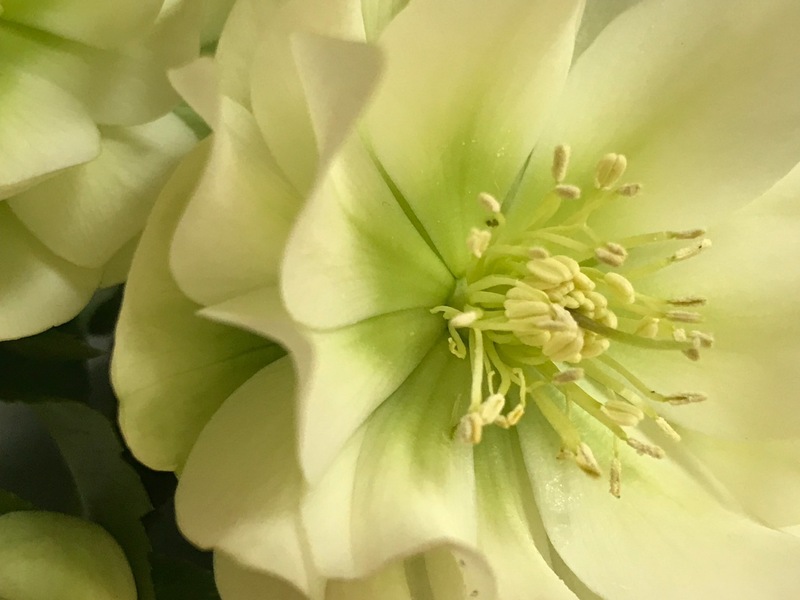 I don’t think I have ever seen two hellebores alike, and you have some lovely ones – the cream one really is a distinctive colour. Beautiful! Love the colour of Double Cream! I’m waiting for all my hellebore seedlings to flower, I’m so curious. They say it doesn’t take long but I fear the drought set them back. That cream-colored Hellebore is gorgeous! Your Hellebores are so pristine. Mine all look a bit raggedy. 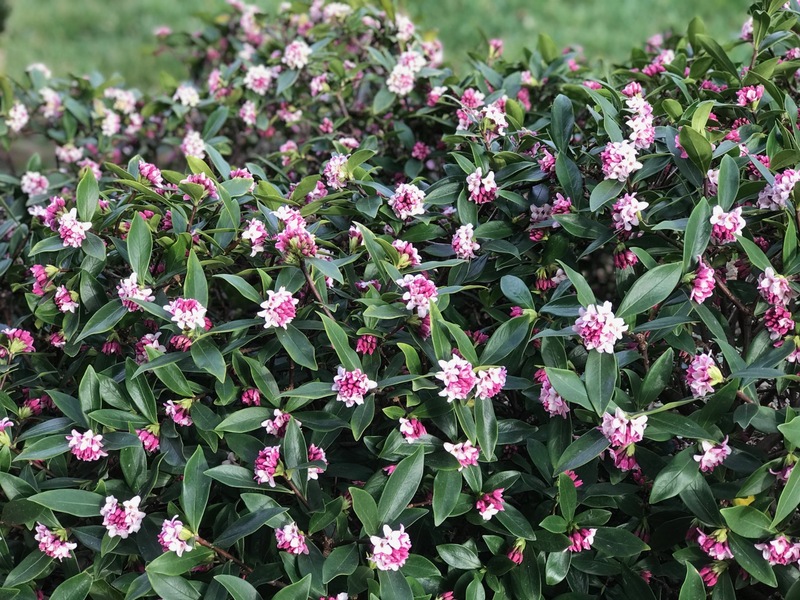 Daphne odora that is not variegated is not even available here. We grew the (relatively) common variegated cultivar in the 1990s. It was not fun to grow, but those who bought them were happy to get them. Landscapers assured me that they looked better once they got established into a landscape than they did in the confinement of pots. Our hellebores were the same. They did not look good in the nursery, but supposedly did much better in landscapes. However, I do not think that the best did as well as they do elsewhere. I never got flowers like yours.